Product / Manufacturer Information at HAVE, Inc. Here you'll find links to information about some of the key product lines, manufacturers, or custom services we offer here in our online store, and offline from our custom cable shop. 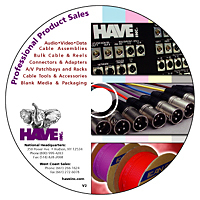 Included here are pages with further information about our own exclusive Flexygy cable and Flexygy cable assemblies, as well as information about our HAVEFlex Audio cable, and PROFlex Video cable lines. You'll also find information about some of the key bulk cable and connector manufacturers we offer products from, including Canare, Neutrik, Gepco, and more. As well as info about the breadth of our offerings of Professional Blank Recordable Media, from manufacturers like Sony Pro Media, Fujifilm, and Maxell. Here you can use our Custom Cable Order Request Form to start the process of having a custom cable assembly manufactured to your specifications. You can also download our Professional Products Catalog, Custom Cable Quote Request Form, Flat Flexygy Audio Snake Flyer, and our Cable/Connector/Tool Cross Reference Chart, all in PDF format, so you can view and use at your convenience.